Aggressive Care Still Common For Dying Seniors, Despite Hospice Uptick : Shots - Health News Even as deaths in acute-care hospitals declined in recent years, the use of intensive care units in the last month of life increased. There has been greater use of hospice care, but much of it was for three days or less at the very end of life, a study finds. 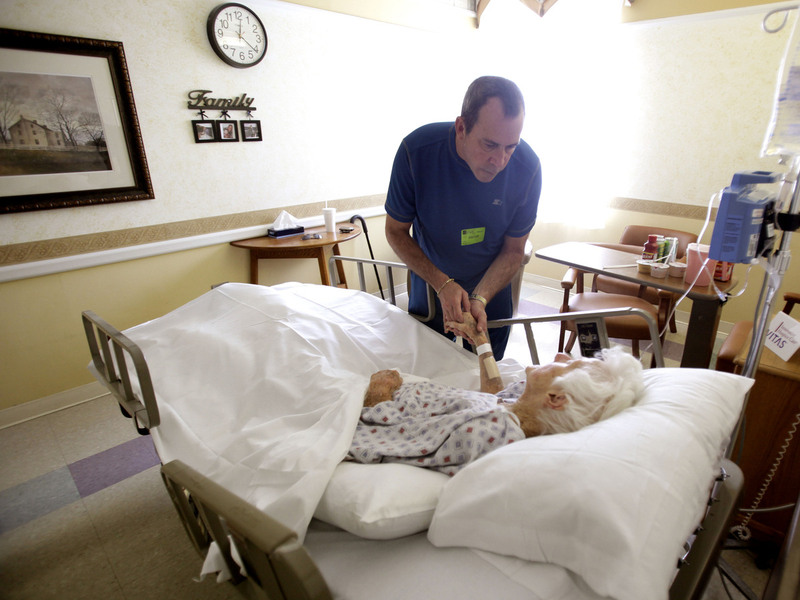 Joe Takach comforts his friend Lillian Landry, as she spends her last days in the hospice wing of a hospital in Oakland Park, Fla., in 2009. Although federal data show that fewer Medicare beneficiaries are dying in hospitals that doesn't mean they're getting a lot less medical care in their final days, new research suggests. Even as deaths in acute-care hospitals declined between 2000 and 2009, the use of intensive care units in the final 30 days of life increased, as did short-term hospice use. The rate of changes to care for these patients, such as transfers within the last three days of life, also increased. To gerontologist Joan Teno, the study's lead author, the increased use of hospice is encouraging but she worries about when seniors are referred to hospice care. "While there is greater access to hospice services, there's also more ICU, more repeat hospitalizations, and more late transitions in the last three days of life," Teno said during an interview. "The good news is that we are referring to hospice. The bad news is we're referring to hospice in the last hours of life." The findings appear in the latest issue of JAMA, the Journal of the American Medical Association. Researchers from the Warren Alpert School of Medicine at Brown University and elsewhere analyzed of Medicare claims data from a random sample of more than 800,000 seniors 66 years and older, who died in 2000, 2005 and 2009. While a 2010 report by the Centers for Disease Control and Prevention had looked at where patients died, researchers in this study examined beneficiaries' medical claims during the last 180 days of life. Hospice use at the time of death increased from nearly 22 percent in 2000 to 42 percent in 2009, the authors reported. But short stays of three days or less went from 22 to 28 percent. About 4 in 10 of those short stays came after time in a hospital ICU. The increase in the number of short hospice stays following hospitalizations, suggest that aggressive care at the end of life is growing, Teno says. "We really need to improve our referral patterns to make sure that people are receiving the appropriate and timely access to palliative care services at the end of the life," she said. Jon Radulovic, the vice president of communications of the nonprofit National Hospice and Palliative Care Organization, says the study adds to concerns about end-of-life care. "With the number of patients (in hospice) who die under seven days or less, it's questionable whether the patient and family caregivers are able to fully benefit from the unique services that hospice offers," he said. With some provisions of the federal health law set to take effect in 2014, Teno sees an opportunity to hold institutions more accountable. "The opportunity under health care reform is to really pay for quality and not pay for another day in the ICU," she said. "Our fee-for-service system has probably resulted in overutilization of care and really, what we want to do is get the right care at the right time, for the right person, at the right location. And we want to respect the patient's right to choose."